The NeuroSpa is the most advanced therapeutic device allowing one to reach complete state of mental and physical well-being. 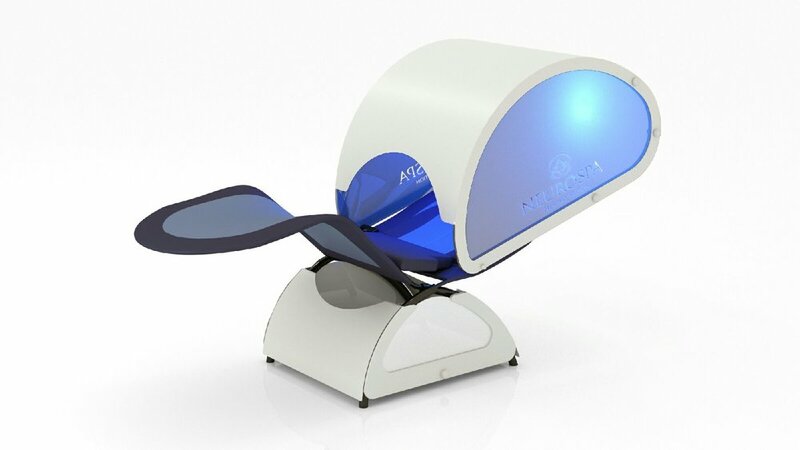 Developed in tandem with renowned health centers and health professionals, the NeuroSpa uses patented worldwide technology to help achieve mental wellness, relieve pain, reduce stress, and induce a relaxation state using multi-frequency acoustic vibration. The NeuroSpa is the result of several years of research on the positive impacts of music on the human body. From the very first minutes, the music and physical sensations are captivating and after 10 minutes or so, they communicate directly with the nervous system which gradually replaces the tensions caused by accumulated stress. Neuromuscular massage propagates via the nervous system. Initially, you may only feel sensations in the lower back; however as the session progresses and your sympathetic nervous system unlocks, your nervous system will gradually connect to the NeuroSpa allowing the neuromuscular massage to first reach painful or tense regions. Later, sensations will travel to the entire body to gradually reduce chronic pains and the negative effects of accumulated stress. After a session, your accumulated stress will have disappeared to make way for true wellness. Daily or weekly use allows achieving a state of well being by neutralizing stress. The NeuroSpa can be used along with our other therapies and services to enhance your experience. Our therapies are designed to provide your body with the proper nutrients to calm the mind, reduce anxiety, promote sleep, lower inflammation, and relieve pains. Adding a NeuroSpa session will increase the effectiveness of our treatments, as it stimulates your nervous system in a way that our infusions and injectables cannot. Don't have much time? Stop in for an injectable and take a breather with our 15 minute session. In no time, you will feel relaxed, loose, and ready to get back to your routine. Getting an infusion? Enjoy 40 minutes of bliss with our extended session that will leave you completely relaxed while you receive your therapy.